Stannah Stairlifts, has been manufacturing stairlifts since 1975 in the United Kingdom and now supply their products to 42 countries around the world including almost all of North America through a dealer network which sells, install and services these lifts locally. Stannah stair lifts manufactures a variety of models that can be installed on most stair configurations. The different models can accommodate straight stairways, intermediate landings, large and small radius curved stairways, both forward and reverse curves. These lifts are battery operated and are automatically charging when not in use by a supplied battery charger that is plugged into a normal household electrical outlet near the staircase. 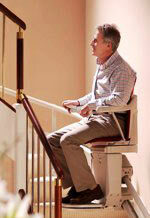 Battery operation of stairlifts provide several benefits over a standard 120 volt stair lift. Battery powered stairlifts do not require a electrical traveling cable which is strung along the length of the staircase and subject to accidental damage. Battery powered stair lifts also use less power as the batteries charge slowly and don't create a large sudden draw on the building's electrical service when the lift is in use. 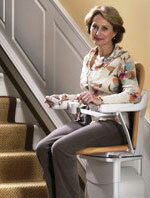 Battery powered stair lifts work during power failures for a limited amount of time. The number of trips the stair lift will do without charging depends on the length of the stairway, condition of lift and batteries and weight of user but should make many trips before depleting the battery. These stair lifts travel up and down the staircase on a rail that is mounted to a few of the stair treads, not the wall. The rails are different depending on the model chosen but are mounted as close to the wall as possible to reduce stairway obstruction. The advantage of mounting to the stair treads is the wall does not have to be re-enforced to support the weight of the lift and the user and when the lift is removed there is little evidence it was ever there. Swivel seat at the top landing to safely block the user from falling down the stairs should they lose their balance. Safety switches on the lift to automatically stop movement should the lift come in contact with anything in the lift's path. Weight capacities of 265 lbs. for curved lifts, 300 lbs. for outdoor model and 350 lbs. for straight staircases. Keyed lockout to prevent unauthorised use.